This limited edition version is bound in leather. The Borderland Provinces are balanced on the knife’s edge of history, as a decadent, declining empire retreats slowly, clinging to power even as it unravels. 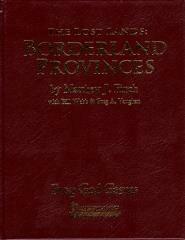 This book contains the history of the Borderland Provinces region, descriptions of the countries, cities (some with maps), towns, important places, major geographical features, lairs, and extensive encounter tables for the ancient Hyperborean roads crisscrossing the Provinces. For those familiar with Lost Lands geography, the campaign book covers the Western part of our Sinnar Coast Region map, an area in great peril, located only a few hundred miles from Bardís Gate and directly adjacent to the Sundered Kingdoms. Award-winning authors Matt Finch and Greg A. Vaughan weave a tapestry of high adventure in the context of a gritty, darkening region of the Lost Lands. And as with everything in the Lost Lands, all is not as it seems . . .